According to a new market report published by Transparency Market Research titled “Surface Mount Technology Equipment Market [(By Equipment Type – Placement Equipment, Inspection Equipment (Device Type and End Use Industry), Soldering Equipment, Cleaning Equipment, Others, By End Use Industry – Automotive, Aerospace and Defense, Consumer Electronics, Healthcare, Industrial and Others)] – Global Industry Analysis, Size, Share, Growth, Trends and Forecast, 2018 – 2026,” the global Surface mount technology equipment market is expected to reach a value of US$ 8,014.8 Mn by 2026. The market is estimated to expand at a CAGR of 4.5% during the forecast period from 2018 to 2026. In terms of volume, the market is expected to reach 208.8 thousand unit at a CAGR of over 4% by 2025. Asia Pacific surface mount technology equipment market is projected to have the highest growth during forecast period. Surface mount technology became widely used in the late 1980’s. SMT equipment refers to that equipment which consist of its components placed on its printed circuit board. This technology is known as surface mount technology which has presently replaced the through-hole technology (THT). This technology aids is utilizing both sides of a PCB as and when required. Additionally, it allows a better level of performance as they can be used with pick and place machines. Rising usage of flex circuit in wearable electronics among different sector mainly in smart phone and smart card industry is the major factor projected to foster the demand and innovation of surface mount technology market during the forecast period from 2018 to 2026. Additionally, growing demand for instruments which is related to medical and defense is anticipated to rise the usage of SMT AXI and AOI equipment. This is likely to lead to boosted usage of surface mounted technology equipment. However, there is a higher price based competition in the global surface mount technology equipment market. The local players of emerging countries are penetrating the markets of established countries by offering inexpensive and effective SMT equipment. Furthermore, seeing the steep growth in world population coupled with rising urbanization, the demand for surface mount technology devices including various switchers, server, and router is expected to grow at a rapid pace in coming decades. Surface mount technology covers detailed segmentation on the basis of equipment type and end use industry. Equipment type is farther divided into device type and end use industry. Placement equipment accounted largest market share in 2017, followed by soldering equipment and cleaning equipment. Surface mount technology component placement systems are commonly known as place and pick machines. These are robotic machineries which are used to place various surface mount devices. In addition, inspection equipment is bifurcated into AOI, AXI, and SPI. AXI device type, under inspection equipment type is expected to grow during the forecast period. This is due to increasing requirement to inspect double-sided solder joints and non-visible solder joints with exact traceability. By end use industry, consumer electronics is leading the market with the CAGR of over 4% and reaches approximately US$ 2000 Mn in the near future, followed by industrial and automotive. Increasing consumer demand for smart packaging is fueling the market for consumer electronics. Additionally, in medical segment, some of the instruments that utilizes surface mount technology are medical cabinet and micro dialysis medical toolkit. Owing to increasing adoption of these two toolkit across the globe, the surface mount technology equipment market is expected to grow significantly during forecast period. Industrial internet of things with new capability to directly control the physical world, including the factories, infrastructure that define the modern landscape. This factor is expected to enhance the demand of global surface mount technology equipment market in coming years. With the growing technological advancement, the application of surface mount devices in different automobile is growing rapidly. Furthermore, the use of these systems helps in increasing the efficiency of the operations, reduces the production time and helps in providing increased safety to the workers which is resulting into improved product quality and affectivity of surface mounted devices and increasing productivity of manufacturers. 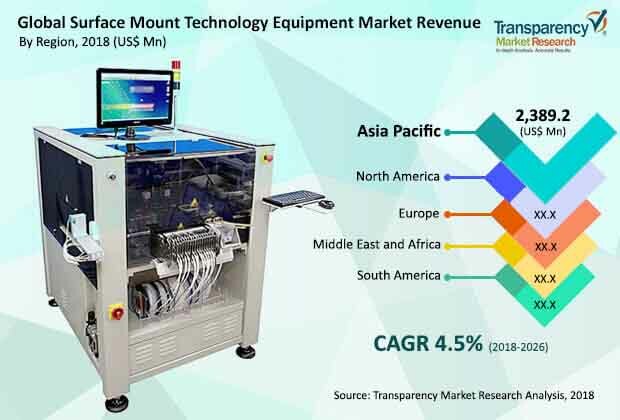 By geography, Asia Pacific dominated the global surface mount technology equipment market in 2017 with more than 35% market share and is expected to maintain its leading position during the forecast period, followed by North America. Across Asia Pacific, China and India are dominating the surface mount technology equipment market, followed by Japan. With the increasing technological advancement, the application of printed electronics circuit in different application which includes display systems, mobile phones, computers, and healthcare instruments among others is increasing. This in turn is fueling the demand and application of surface mount technology equipment in Asia Pacific. Some of the leading players of the surface mount technology equipment market are Mycronic AB, Nordson Corporation, Viscom AG, Fuji Machine Mfg. Co., Ltd., ASML Holding, N.V., KLA-Tencor Corporation, Juki Corporation, Panasonic Corporation, Hitachi, Ltd., Orbotech Ltd, JUTZE Intelligence Technology Co., Ltd., Koh Young Technology, Mirtech, Omron Corporation, PARMI Corp., Test Research, Inc., and Yamaha Motor Co., Ltd. among others. The companies involved in this market are concentrating on research and development activities along with mergers and acquisitions, and product innovation to strengthen their foothold in this market. Moreover, strategic partnerships and agreements with other firms is another key business strategies adopted by the surface mount technology equipment companies across different regions. For instance, In December 2016, Juki Corporation launched a new Long Board SMT Placement Machine JX-350 with innovative placement speed and better component capability for LED manufacturing industry. The surface mount technology equipment market is segmented as below.